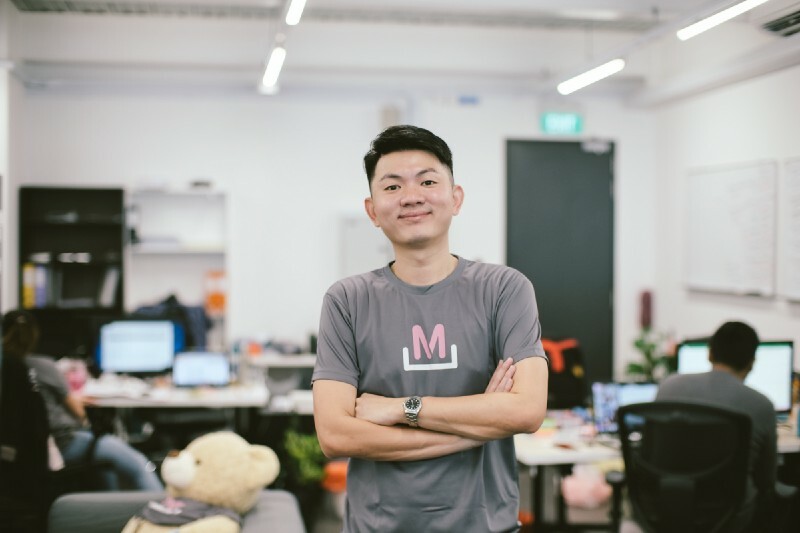 Hey everyone, I’m Junxian, Co-founder and CEO of Moovaz. I help to spearhead our company’s strategy and growth and drive our mission in creating a life well moved for everyone. I believe that life’s a journey and that there is much to enjoy from our experiences, even in the toughest storms. It is in these moments that we learn how strong our anchors truly are and when the waves eventually subside, we can sail ahead with greater courage and resolve. To share a bit more about my journey, I’d say that my path hasn’t been the most conventional, or in any case linear. I graduated locally from the NUS Business School and like many, started my career with a job in the finance industry. Subsequently, I went on to pursue my studies in Harvard University and Fudan University. I developed a curiosity and passion for the tech and startup industry, and upon completing my studies in Fudan University, I was given the privilege of joining the ventures team in Garena. It was also with a stroke of good fortune (and a bunch of really cool dudes) that we launched a project named Shopee across the region. Riding on the booming wave of e-commerce, I garnered my first experience of launching a tech project simultaneously across the region. The operational lessons I accumulated from this experience proved invaluable for my future endeavours. With this, I went on to co-found three other companies — Fundnel, a digital private investment platform offering unlisted securities in growth and pre-IPO stage companies; CashShield, an online fraud risk management company in the cybersecurity space; and now, Moovaz, a one-stop online aggregator platform that fulfils all relocation needs, in an attempt to revolutionise the logistics industry. Amidst all these, I also have a strong passion for cooking and decided to start my very own café at some point in time, which has since grown into a chain of restaurants today. I’ve held various roles across different industries and one thing continues to ring true with each new venture I embark on — the importance of committing to and building good people. Good leaders don’t create followers; they create leaders. In a relentlessly competitive and fast-changing business world where adaptability and agility are key, a strong and united team continues to be our sustainable competitive advantage. We have the very best team at Moovaz and I am confident that this is why we will win. This is Jerry, Co-founder and Chief Revenue Officer of Moovaz. I first met him back during our undergraduate days at NUS Business School. Despite first starting his career in global banks and some of the world’s largest MNCs, Jerry eventually found his passion and purpose at the opposite end with startups. Jerry was one of the earliest businessmen to spot the opportunity in Myanmar and co-founded several initiatives there. He was the Principal Consultant at Infra Capital Myanmar, where he researched, funded and launched sustainability projects with the backing of major UK development funds. He was also the Managing Director of IFG Asia, where he paved trade channels for physical commodities around the region, as well as developed infrastructure projects in the telecommunications and hospitality industries. Jerry firmly believes in the importance of casting our sights into the future. He is a proponent of resilience in adversity and these beliefs motivate him to be constantly on his toes, to innovate, adapt, and evolve. Just ask him what his favourite quote is and you’ll discover it for yourself! Vishnu is our Co-founder and Chief Operations Officer of Moovaz. I first met him on exchange in Vienna during my undergraduate days — who knew we’d end up starting a business together! Vishnu is one of the earliest tech entrepreneurs I know. Upon graduation, he founded Reizo, a tech startup for bespoke online tailoring, which subsequently got acquired with a very decent upside. Together with Jerry, he went on to co-found and launch Infra Capital Myanmar and operated their projects in the region. Vishnu also comes with a strong foundation in the logistics industry. He runs Tech Asia Logistics, one of Singapore’s most acclaimed sub-contractors in the logistics and moving industry, and runs one of the strongest crew in the country. Vishnu is one whom we can safely call a highly driven visionary. He finds joy in the arduous process of building projects from the ground up and has proven to possess the tenacity to see even the toughest times through. He believes in putting in his best at whatever he endeavours in and always strives to be ahead of his competition. How did the three of us ended up launching Moovaz together? Jerry and Vishnu had an idea of disrupting the conventional way global relocation was done in today’s day and age. Vishnu was particularly zealous about it, having operated in the industry for the past 7 years. The winds of change are clearly upon the logistics industry and we were sitting on a golden opportunity to bring cutting-edge technology to democratise the existing relocation services market. Consumption habits of relocating professionals were changing due to cost containment measures, and the ‘gig economy’ millennials were demanding for sleeker and swifter online solutions. Juxtaposed against our research which uncovered the nascency of the logistics technology industry in our region, and the emerging trends in the U.S., we made a call to start Moovaz. We started Moovaz to bring the world closer together by enabling a seamless and truly moving experience for everyone. My partners and I have been on the receiving end of such relocation services, having studied and worked overseas during the course of our careers. We believe that there is a more efficient way to get people from one place to another and this process does not have to be complex and stressful. 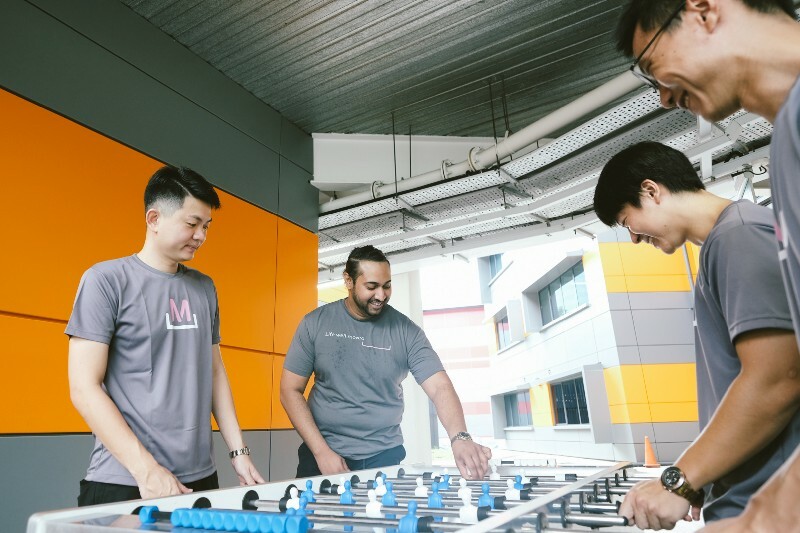 Hence, Moovaz was built with customers’ needs in mind — to make moving and relocating cheaper, faster, more transparent, and to provide open access to individuals and families around the world. By breaking down these barriers can we then fulfil our promise to you in delivering a ‘Life Well Moved’. We are not just movers; we are lifemovers. The logistics industry is one of the oldest industries in the world. Even though logistics powers the entire world today, it is also one that faces the biggest and deepest challenges when it comes to change. We wanted to build a brand that stands out from the crowd — one that resonates with our core business of moving lives; that our customers could readily relate to and more importantly, one that depicts the modernity we want to instil into the industry. Moovaz, which phonetically sounds like ‘move us’ and ‘movers’, was designed with double ‘O’s (resembling truck wheels) to increase our identifiability with the moving industry. From the onset, we are a global company (owing to the nature of international relocation) and we wanted to emphasise our promise to our customers that we will be responsible shippers, moving lives from from A to Z (wherever that may be) in the best possible way. This explains the ‘AZ’ in our name. The zenith was really in designing an award-winning brand identity around our name. We were committed to this as we knew that a strong brand identity would not only pluck at the heartstrings of our customers but more importantly, a strong brand would help to instil dignity and pride into what many view as a ‘sleepy industry’. We wanted the brand to manifest our ideals and wishes for the future of global mobility worldwide. To accomplish this, we engaged the help of Benedict Wong, a proven and renowned brand strategist. After spending a fair bit of time talking to Junxian, Jerry and Vishnu to find out more about the business, insider knowledge, research and insights, I realised how they wanted to position themselves differently from the people in the trade. One significant piece of insight stood out: when it comes to relocating, movers make quick promises, but often break those same promises on prices once everything is in the warehouse. This piece of insight provided fresh inspiration to kickstart the entire design process. We wanted a brand identity that reinforced the brand idea (and eventually the tagline) of ‘Life Well Moved’, and that made us realise that most of the traditional players in the industry were right-wing and functional. I then figured that being a bit left-leaning with a bit of cheek would be the best way to box in the target market that Moovaz was going after. With that, I started designing the brand and we ran a couple of quick design sprints and iterations to get a read on what visual and colour space Moovaz was comfortable with. Ultimately, it came down to a rather surprising and overwhelming preference for the current colour scheme that you see right now. 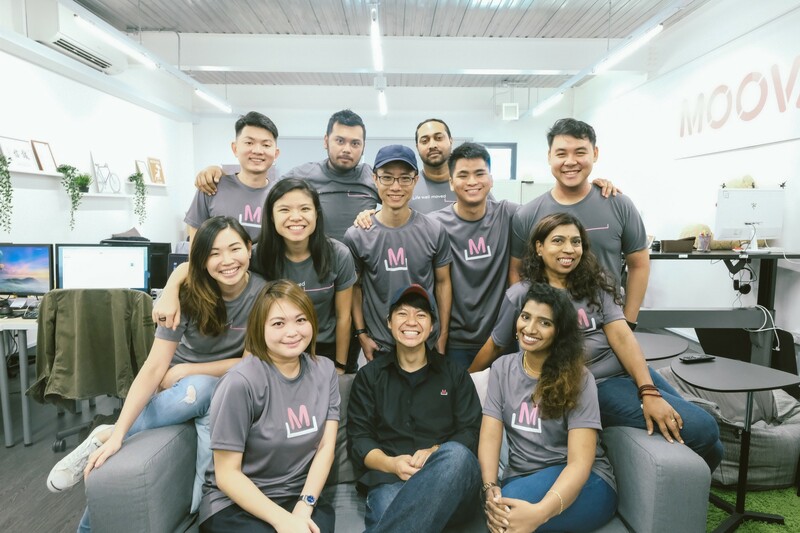 Pink is not a colour that you would traditionally associate with a logistics and moving company, and this would enable Moovaz to stand out. Moovaz’s personality is about being clever, confident and human above everything else. Moving from, and to countries is a big enough headache on its own, and logistics has its own set of arcane mumbo jumbo that we’d like to provide guidance on to make that process a more positive experience — whatever and wherever you’re headed next. The team and I stayed true to our vision, took this leap forward and never looked back. Armed with our brand identity and beliefs, we seek to redefine what global mobility stands for through our brand, communications, service excellence and technology. And that’s the story of how Moovaz came about — centred around three entrepreneurs who had a vision to create a life well moved for the world.